In the U.S. in the 21st century, parents do everything they can to make sure their children never experience foot problems. We carefully fit them for shoes that offer proper arch support and enough room for growing feet to wiggle. This care and attention to fostering children’s foot growth has not, however, always been the norm. Up until 1912, many Chinese girls were subjected to the ancient rite of foot binding. When girls were between four and seven years old, before the arch of their feet had developed, the process would have to begin. First, the girls’ feet would be soaked in a mixture of animal blood and herbs; next, their toe nails were clipped and they got a foot massage. Following the ‘pampering,’ every toe except the big one was broken. After fracturing the girls’ toes, they were held tightly against the sole of the foot and the arch was broken, too. Finally, after these painful rituals, the feet were wrapped tightly in cloth; each day, the feet were rewrapped and placed into increasingly smaller shoes, with the ultimate goal of creating a foot that was just four inches long. All of this was done because small feet were considered beautiful, but children’s feet want to be healthy, and many of the girls experienced healing as they grew older. Unfortunately, because they were not set properly, the fractured bones repeatedly re-broke, and toenails were much more likely to become ingrown and infected. Over the years, people began to protest the practice but it was not until 1912, after the fall of the Qing Dynasty, that foot binding was finally banned; even still, it wasn’t until 1949 that the prohibition was strictly enforced. Just recently, the UK’s Daily Mail profiled a 102 year old who is thought to be one of the last surviving women with bound feet. Han Qiaoni, from northern China, had her feet broken and bound when she was just two; she says it took six months before she was able to walk properly and get used to the pain of her bound feet. 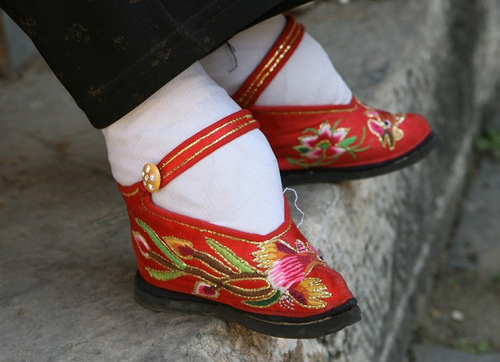 While foot binding used to be widely accepted, today we know that our children’s feet should never hurt. If your child is having any discomfort while walking, running or playing, schedule an appointment with Houston podiatrist Dr. Andrew Schneider to make sure their feet are developing properly and to avoid any problems down the road.